Coating engine components with hard carbon reduces friction to almost zero – a development that could save billions of liters of fuel worldwide every year. Now researchers have developed a new laser method to apply the coating on the production line. Scientists already know how to coat components with diamond-like carbon to minimize friction. But now Fraunhofer researchers have developed a laser arc method with which layers of carbon almost as hard as diamond can be applied on an industrial scale at high coating rates and with high thicknesses. By applying carbon coatings to engine components such as piston rings and pins, fuel consumption can be reduced. "Systematic application of our new method could save more than 100 billion liters of fuel each year over the next ten years," says Prof. Andreas Leson from the Fraunhofer Institute for Material and Beam Technology IWS in Dresden, referencing a study that was published in the journal Tribology International in 2012. Carbon-based coatings are already used in volume production. 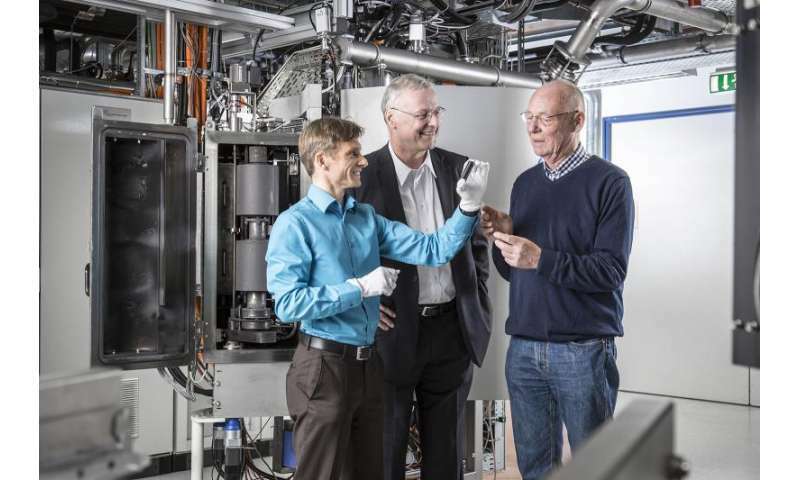 But now the team of IWS researchers led by Prof. Leson, Dr. Hans-Joachim Scheibe and Dr. Volker Weihnacht has succeeded in producing hydrogen-free ta-C coatings on an industrial scale at a consistent level of quality. These tetrahedral amorphous carbon coatings are significantly harder and thus more resistant to wear than conventional diamond-like coatings. "Unfortunately, you can't just scrape off diamond dust and press it onto the component. So we had to look for a different method," says Dr. Scheibe, who has spent over 30 years investigating carbon's friction-reducing properties. In a similar style to old-fashioned film projectors, the laser arc method generates an arc between an anode and a cathode (the carbon) in a vacuum. The arc is initiated by a laser pulse on the carbon target. This produces a plasma consisting of carbon ions, which is deposited as a coating on the workpiece in the vacuum. To run this process on an industrial scale, a pulsed laser is vertically scanned across a rotating graphite cylinder as a means of controlling the arc. The cylinder is converted evenly into plasma thanks to the scanning motion and rotation. To ensure a consistently smooth coating, a magnetic field guides the plasma and filters out any particles of dirt. The laser arc method can be used to deposit very thick ta-C coatings of up to 20 micrometers at high coating rates. "High coating thicknesses are crucial for certain applications – especially in the auto industry, where components are exposed to enormous loads over long periods of time," says Dr. Weihnacht. The automotive and motorcycle manufacturer BMW is working intensively on the industrial-scale implementation of ta-C engine components in its various vehicle models with the aim of reducing their fuel consumption. Prof. Leson sees this as the first major step in using the laser arc method to save resources. And as a motorcycle aficionado himself, he also sees another positive effect stemming from this development: "The fact that our research is helping to make motorcycling more environmentally friendly eases my conscience every time I go for a ride," he says, unable to suppress a smile. Andreas Leson, Hans-Joachim Scheibe and Volker Weihnacht received the 2015 Joseph von Fraunhofer Prize for the development of the laser arc method and the application of ta-C coatings in volume production.